08/07/16 -- EU grains closed mostly higher to end the week, although Jul 16 London wheat was unchanaged at GBP111.75/tonne. Sep 16 Paris wheat traded up EUR3.25/tonne at EUR159.00/tonne, Aug corn was EUR1.50/tonne firmer at EUR171.00/tonne and Aug 16 Paris rapeseed was EUR2.50/tonne higher at EUR352.50/tonne. For the week London wheat was up GBP1.75/tonne, Paris wheat gained EUR6.75/tonne, corn added EUR1.25/tonne and rapeseed was down EUR5.25/tonne. Rapeseed continues to stalk Chicago soybeans. The 2015/16 season is now officially over, and Europe finished up issuing 31.5 MMT worth of soft wheat export licences, a similar volume to the previous season after things picked up in the second half. Barley export licences totalled 10.2 MMT. For the first week of the new season Brussels released 209 TMT worth of soft wheat licences and 193 TMT worth of barley licences. They also approved the import of 156 TMT of corn. Wheat exports were thus down 55% on the same week in 2015, with barley licences falling by 53%. Ukraine said that they've harvested 12% of their planned early grain area producing a crop of 3.86 MMT to date. Yields are up 14% at 3.47 MT/ha. This total includes 1.61 MMT of wheat and 2.55 MMT of barley. Agritel say that only around 30% of the wheat cut so far is of milling standard after recent rains damaged quality and cut gluten levels too. Better samples are expected once the harvest progresses to the centre of the country however, they suggest. Russia's harvest stands at 9.6 MMT with yields also up 14% at 4.33 MT/ha. That includes 6.4 MMT of wheat and 2.2 MMT of barley. French crop conditions continue to decline, with FranceAgriMer slashing 6 points off the good to very good categories for the second week running. The proportion of the crop rates G/VG is now only 59% versus 75% a year ago. 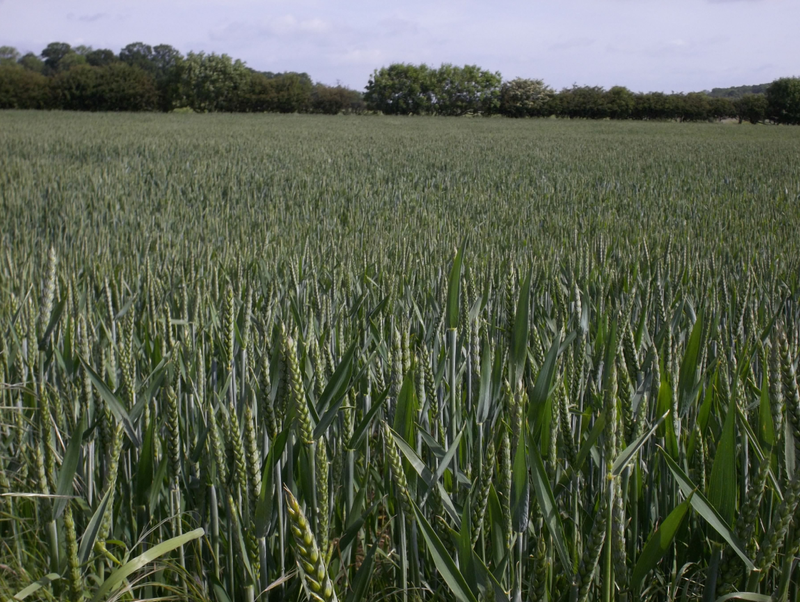 Winter barley was cut 9 points G/VG to 53% and spring barley G/VG is now 67% form 71% a week ago. Corn conditions were up 1 point to 69% G/VG. They said that the winter wheat harvest was 25% done in Aquitaine and 1% complete nationally. Winter barley harvesting is only 16% complete versus 73% done a year ago as rain stops play. 07/07/16 -- Soycomplex: Soybeans closed with big losses again on fund liquidation. Weather models have changed to wetter and cooler. Weak crude oil and the strong dollar added to the bearish tone. Still, August is the key month for determining bean yields, not July, the remaining bulls would point out. Few would therefore say that this weather market is finished with just yet. I'd expect bargain hunting/light consolidation ahead of the weekend to kick in tomorrow. China was reported to have bought 120,000 MT of new crop beans under the daily reporting system, CONAB dropped their Brazilian production estimate from 95.6 MMT to 95.3 MMT. The one day delayed weekly export sales will be reported tomorrow with the trade expecting bean sales of 900,000 MT to 1.25 MMT over both crop years. Jul 16 Soybeans settled at $10.54 1/4, down 52 cents; Nov 16 Soybeans settled at $10.24 3/4, down 48 1/2 cents; Jul 16 Soybean Meal settled at $370.00, down $16.00; Jul 16 Soybean Oil settled at 29.73, down 52 points. 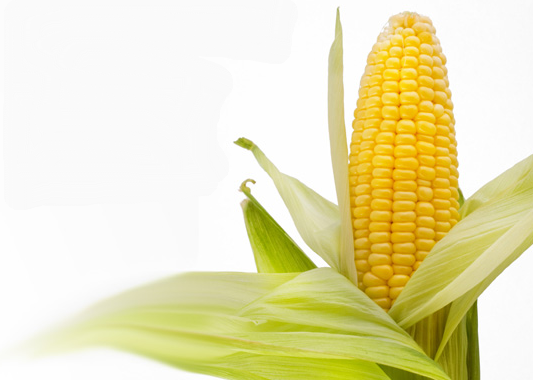 Corn: The corn market closed around unchanged. The immediate US weather remains a bearish influence. However, Brazil’s CONAB estimated the second season 2015/16 corn crop at 43.05 MMT, down from the 50.0 MMT previous estimate. The total 2015/16 corn crop was at 69.14 MMT vs. 76.22 MMT previously. That's quite a lot of corn to disappear off the world market all in one go. Weekly US ethanol production was down 19 million barrels/day to 984,000 bpd. MDA CropCast estimated the world corn crop up 4.21 MMT from previously at 961.6 MMT. Israeli private buyers bought 120,000 MT of option origin (beliveed to be Black Sea material) at $169.00-169.50/tonne C&F. Trade estimates for tomorrow's weekly export sales report for corn are in the region of 900,000 MT to 1.25 MMT, similar to soybeans. Jul 16 Corn settled at $3.35 1/2, down 1/4 cent; Sep 16 Corn settled at $3.41 3/4, up 1/4 cent. Wheat: The wheat market closed lower across the three exchanges. MDA CropCast increased their view on the 2016/17 world wheat crop by 13.8 MMT to 744.0 MMT. US all wheat was up 9.77 million bushels to 2.1837 billion bushels. South Korea are tendering for 23,000 MT of US milling wheat for December shipment. Israel bought 85,000 MT of feed wheat at $161.50-165.50/tonne C&F. Deteriorating crop conditions in France keep getting flagged up, but appear outweighed by much better than expected yields out of Russia. The fact that the Russian Ag Min said that they will not consider removing the export duty on wheat until the autumn might temper their export efforts in Q1 of 2016/17 however. That won't be the case in Ukraine though where the harvest is also progressing nicely and yields are much better than a year ago. Trade estimates for tomorrow's weekly export sales report are 350,000 to 650,000 MT. Jul 16 CBOT Wheat settled at $4.12, down 3 3/4 cents; Jul 16 KCBT Wheat settled at $3.96 1/2, down 4 cents; Sep 16 MGEX Wheat settled at $4.95 1/4, down 7 cents. 07/07/16 -- EU grains finished the day mostly higher as local weather worries and crop downgrades outweighed bumper prospects further east. At the close Jul 16 London wheat was unchanged at GBP111.75/tonne. Sep 16 Paris wheat closed EUR2.00/tonne firmer at EUR155.75/tonne, both Aug 16 corn was also up EUR2.00/tonne at EUR169.50/tonne and Aug 16 rapeseed was unchanged at EUR350.00/tonne respectively. Strategie Grains yesterday reduced their forecast for the French soft wheat crop by 2 MMT to 36.5 MMT, and ODA today went even lower at 35.0 MMT (2015: 40.8 MMT). 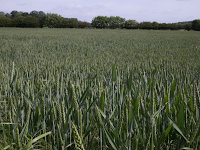 The IGC forecast the UK wheat crop down 9% at 14.9 MMT versus 16.4 MMT a year ago. The German Farmers Association estimated production there at 25.0 MMT this week, some 4.4% lower than a year ago. There seem to be no such problems in Russia, where the 2016 harvest has already brought in 6.4 MMT of wheat, with yields up 21% at 4.75 MT/ha. The barley harvest in Ukraine is progressing quickly, with yields here also sharply higher than a year ago and some port congestion is already starting to build, according to Agritel. The say that Ukraine barley prices at the ports are down to $124/tonne from $140/tonne a fortnight ago. Israeli buyers said that they'd booked 120,000 MT of corn, 85,000 MT of feed wheat and 15,000 MT of feed barley in their tender. Optional origin was specified, but Black Sea material is likely to be what they get. The Russian Ag Min said that the issue of export duties on wheat will be returned to in the autumn after the harvest, and that they will not be removed just yet. That may keep sellers there out of the market for a wee while, although any void is likely to be filled by Ukraine/Romania/Bulgaria and the like. The FAO raised their view on world wheat production from 724 MMT to 732 MMT, increasing ending stocks by 1 MMT to a 15-year high of 217 MMT. 06/07/16 -- Soycomplex: Beans closed lower, but well off session lows as the fallout from good weekend rains continues. Some continue to point to a long-term drier/hotter forecast for August, but that's a long way off and could easily change. Heavily long fund money wants out, so down is the path of least resistance. A USDA attaché in China said that feed industry growth there could push 2016/17 soybean imports up to a record 86 MMT. Jul 16 Soybeans closed at $11.06 1/4, down 10 3/4 cents; Nov 16 Soybeans closed at $10.73 1/4, down 4 cents; Jul 16 Soybean Meal closed at $386.00, up $0.60; Jul 16 Soybean Oil closed at 30.25, down 57 points. Corn: The market closed with significant losses, ending lower for a fifth session in a row. As with beans, weather related fund liquidation is the key reason behind the move. Active showers, and the prospect of more to come - the 5 day models are projecting upwards of 4 inches for Iowa - have sent the bulls scurrying for the exits. It is estimated that funds have now halved their long position in under a week. The late rally in beans didn't spill over into the corn pit today, which stayed locked in around 10 cents lower. Jul 16 Corn closed at $3.35 3/4, down 8 1/4 cents; Sep 16 Corn closed at $3.41 1/2, down 9 1/4 cents. Wheat: The wheat market ended lower. 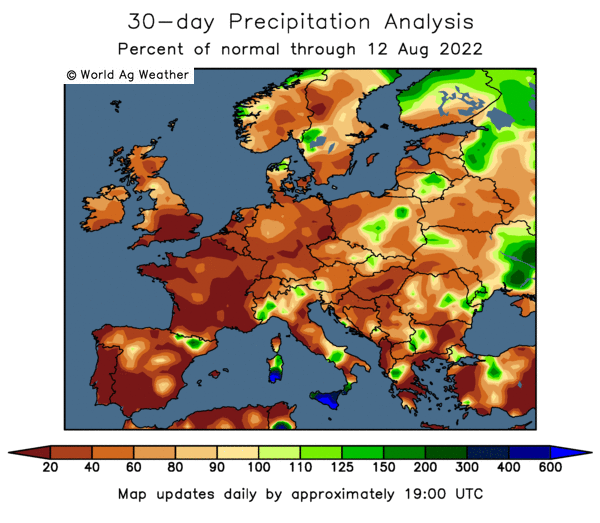 Apart from lower production worries in odd parts of Europe, wheat hasn't got a bullish story. Bumper production appears to loom from Russia and Ukraine again this year. Meanwhile in Canada, "Prairie crops are in great shape, much better than last year after weather conditions this summer have been exceptionally wet in the 3 main prairie farm provinces Saskatchewan, Alberta and Manitoba," said Martell Crop Projections. "Daphne Cruise, the regional crop specialist with Saskatchewan Agriculture, anticipates a bumper harvest, claiming the crop has the potential to rival the 2013 crop. Wheat production then totaled 37.53 MMT, the largest crop on record," they add. Jul 16 CBOT Wheat closed at $4.15 3/4, down 3 3/4 cents. 06/07/16 -- EU grains finished mostly lightly mixed, although rapeseed took a tumble courtesy of sharply lower soybean prices States-side. The day ended with Jul 16 London down GBP0.05/tonne at GBP111.75/tonne, Sep 16 Paris wheat was down EUR0.50/tonne at EUR153.75/tonne, Aug corn was also EUR0.50/tonne lower at EUR167.50/tonne and Aug 16 rapeseed tumbled EUR4.75/tonne to EUR350.00/tonne. 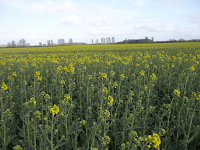 This was the lowest close for rapeseed since March. Russia said that they'd cut 1.9 million ha of new crop cereals so far, producing a crop of 8.4 MMT, with yields of 4.32 MT/ha (3.87 MT/ha in 2015). Wheat has been cut on 1.2 million ha of that, for a crop of 5.3 MMT to date. Barley accounts for another 2.2 MMT off 515k ha. Confidence is growing that this is going to be a bumper crop for Russia, and thus that they will be very aggressive competition on the export front again in 2016/17. Russian customs data said that they'd exported 36.89 MMT of grains in 2015/26 (a new record), including 24.08 MMT of wheat. So far this marketing year (Jul 1-5) exports stand at 220 TMT, including 90 TMT of wheat. 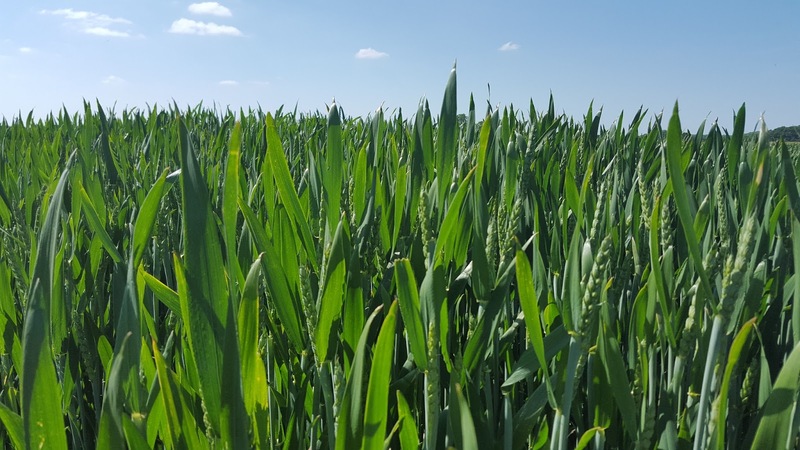 Strategie Grains cut their forecast on French soft wheat yields to 6.98 MT/ha from 7.38 MT/ha, potentially taking the crop down to 36.5 MMT from 38.5 MMT previously and well over 40 MMT a year ago. 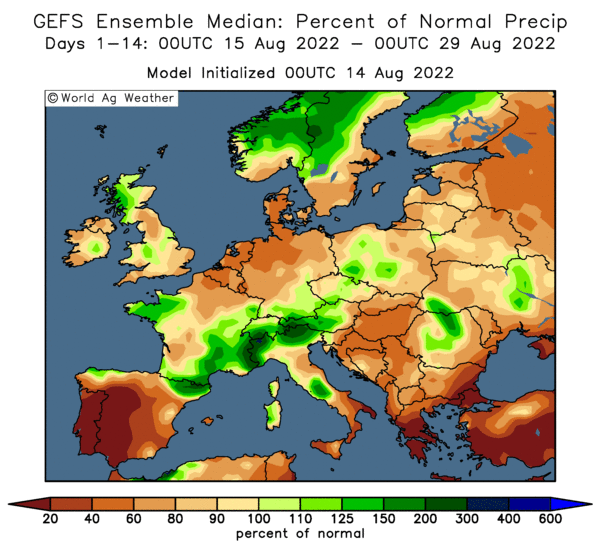 The move comes despite French sowings reaching the highest levels since the Second World War this year following incessant rains - especially in the north of the country. The 2016/17 season is already shaping up to be one where Russia and Ukraine dominate early proceedings, and the EU is left fighting for the scraps. Some of the negative effect of the large downgrade to the French crop will be made up by the unusually large carryover stocks from last season. 05/07/16 -- Soycomplex: Soybeans closed heavily lower on weekend rains that reached some of the drier areas. A wetter and cooler outlook got fund money scrambling for the exits. "A series of short wave disturbances would bring showers to the Midwest this week generating heavy rainfall in corn and soybeans. Cooler temperatures would dominate the farm belt in the upcoming week, 4-6 degrees F below average," Said Martell Crop Projections. However longer term August outlooks continue to maintain hot/dry, so this weather market probably isn't over just yet. Weekly export inspections were below expectations. 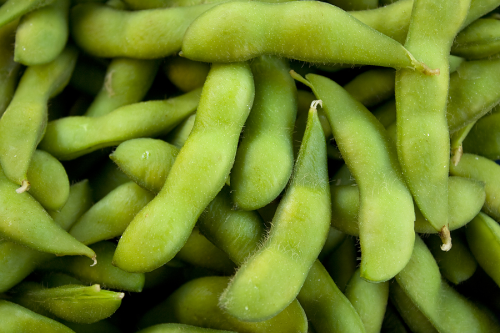 The weekly crop progress report showed a 2 point drop in soybeans good to excellent to 70%. That also said that 22% of the crop is blooming versus 16% normally at this time. Celeres in Brazil estimates that 2015/16 soybean production there will be 97.7 MT (USDA: 97.0 MT), down from their estimate of 100.2 MT in June. Jul 16 Soybeans settled at $11.17, down 51 3/4 cents; Nov 16 Soybeans settled at $10.77 1/4, down 60 1/4 cents; Jul 16 Soybean Meal settled at $385.40, down $19.40; Jul 16 Soybean Oil settled at 30.82, down 21 points. Corn: The corn market finished the day sharply lower. The change in the weather is seen benefiting corn as well as beans. "Heavy rainfall would be ideal for developing corn and soybeans needed to replenish dry fields. Hardly any rainfall developed last week, so showers are welcome. Cooler temperatures this past week would also benefit corn and soybeans, slowing evaporation from the soil surface that thus conserving ground moisture. Drenching rain would develop at the ideal time as corn is just starting to pollinate," said Martell Crop Projections. After the close the USDA said that 15% of the crop is silking (pollinating) versus 13% on average. They left good to excellent crop conditions unchanged on a week ago at 75%. Weekly export inspections were in line with expectations at 1.64 MMT. Private Israeli buyers are tendering for 120,000 MT of optional origin corn, with Ukraine material likely to figure. They exported 17.4 MMT of corn in 2015/16, according to the Ukrainian Ag Ministry, versus USDA forecasts of 16.0 MMT. Jul 16 Corn settled at $3.44, down 9 cents; Sep 16 Corn settled at $3.50 3/4, down 9 1/4 cents. Wheat: The wheat market shrugged off the downwards pull of corn and beans and managed to close a wee bit higher. Weekly export inspections of 560,598 MT were up 9% from the week before, and 50% larger than the same week a year ago. Japan tendered for 102,000 MT of US/Canadian wheat. The FAS in Morocco said that their 2016 harvest was down by two thirds and that the country would probably need to import more wheat and barley in 2016/17. Israeli buyers are tendering for 115,000 MT of feed wheat and 15,000 MT of feed barley of option origin. Ukraine said that they'd exported 17.35 MMT of wheat in 2015/16 versus a USDA estimate of 15.8 MMT. Various estimates now have the 2016 Russian grain harvest as high as 112 MMT (2005: 104.8 MMT), with wheat accounting for at least 65 MMT of that. Harvesting there is underway now, with 6 MMT of grain in the bin already. The Egyptian Ag Min said that they'd now formally agreed a 0.05% limit on ergot which should pave the way for "a return to normal" business there. They should be in the market soon with prices at multi-year lows. Jul 16 CBOT Wheat settled at $4.19 1/2, up 3 1/4 cents; Jul 16 KCBT Wheat settled at $4.02, up 7 3/4 cents; Sep 16 MGEX Wheat settled at $5.08 1/4, up 8 1/4 cents. 05/07/16 -- EU grains closed mixed with thinly-traded Jul 16 London wheat closing up GBP0.55/tonne at GBP111.80/tonne. Sep 16 Paris wheat traded up EUR0.25/tonne at EUR154.25/tonne, Aug corn was EUR1.75/tonne lower at EUR168.0015/tonne and Aug 16 Paris rapeseed was EUR3.00/tonne lower at EUR354.00/tonne. US markets were closed for much of the day, leaving EU grains devoid of some much-needed direction. The German Farmers Association (DBV) estimated the grain crop there this year in line with the 5-year average of 47.2 MMT at 47-48 MMT, although down a little on last year's 48.9 MMT. They said that around 200k ha of land was badly affected by excessive rain and hail this year, around 3 times the norm. 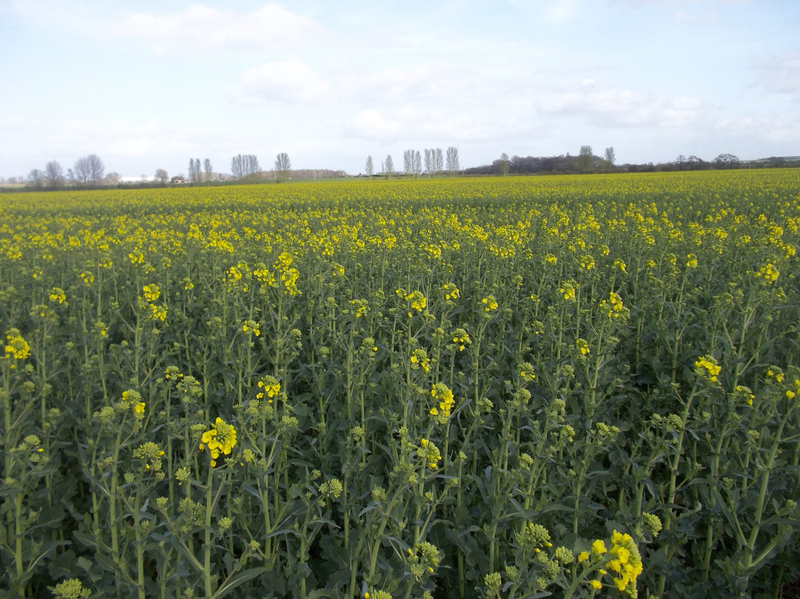 Winter OSR production will probably be around 5 MMT, they added. Severe drought in Morocco means that their 2016 harvest is going to be very poor, with wheat production of only 2.8 MMT versus a previous estimate of 3.7 MMT and 8.0 MMT last year, say the USDA's FAS. Barley production is estimated at just 0.9 MMT versus 1.0 MMT previously and 3.5 MMT a year ago. 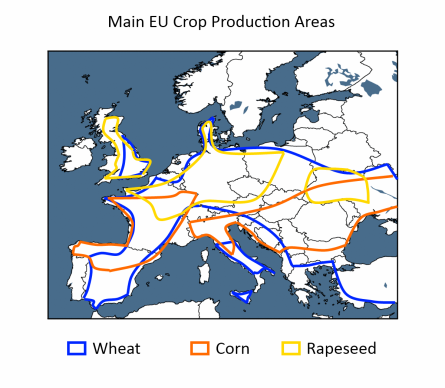 "All this could lead to Morocco increasing its imports of grains including barley and wheat. 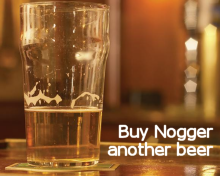 This therefore could be an opportunity for the UK to increase its exports to the country," the HGCA noted. "Morocco is already one of the UK’s target export market for wheat with exports so far 2015/16," they added. The recent demise of sterling following the Brexit vote should help competitiveness, although it's starting to look s if France may have a lot more feed barley, and possibly wheat too, than normal. Meanwhile, "the average UK feed wheat ex-farm price for the whole of 2015/16, which ended last week, was at £104.9/t, according to AHDB’s Corn Returns. This is the lowest average price since 2009/10 and reflects the ample global supplies of wheat this season which has been depressing prices," said the HGCA. Israeli private buyers are tendering for 120,000 MT of corn, 115,000 MT of feed wheat and 15,000 MT of feed barley, all of optional origin. Egypt are said to have finally agreed to take wheat with an ergot tolerance of 0.05%, seemingly opening the doors for new tenders there soon. 05/07/16 -- US markets are closed until this afternoon for Independence Day, so there's no Globex market to get us excited, The word is that the promised weekend rains mostly delivered, certainly in central/eastern areas, so a lower opening is expected. Egypt have apparently finally agreed to take wheat with an ergot tolerance of 0.05%, seemingly opening the doors for new tenders there soon. Agritel say that early barley yields and specific weights in France confirm post-harvest nerves and are disappointing. That's not the case in Russia or Ukraine though where record harvests are being predicted. Russia say that they've harvested 6 MMT of grains so far, off 1.4 million ha, with yields averaging 4.27 MT/ha (3.55 MT/ha a year ago). Ukraine say that they've harvested over 2 MMT of early grains off 576k ha, with yields coming in at 3.54 MT/ha (3.05 MT/ha in 2015). They've harvested 369 TMT of new crop wheat and 1.6 MMT of new crop barley so far. The Russia Grain Union have apparently written to the PM asking him to removed the existing export duty on wheat, now that a bumper 2016 crop looks assured. They predict 2016 grain production at 112 MMT, of which wheat will account for around 65 MMT (104.8 MMT and 61.7 MMT in 2015). Japan are in for 102 TMT of milling wheat of US/Canadian origin in their usual weekly tender. 04/07/16 -- With US grain closed for Independence Day it was always likely that this would be a dull and low volume affair, and so it proved. At the close Jul 16 London wheat was GBP1.250/tonne higher at GBP111.25/tonne. Sep 16 Paris wheat closed EUR1.75/tonne firmer at EUR154.00/tonne, both Aug 16 corn and Aug 16 rapeseed were unchanged at EUR169.75/tonne and EUR357.75/tonne respectively. 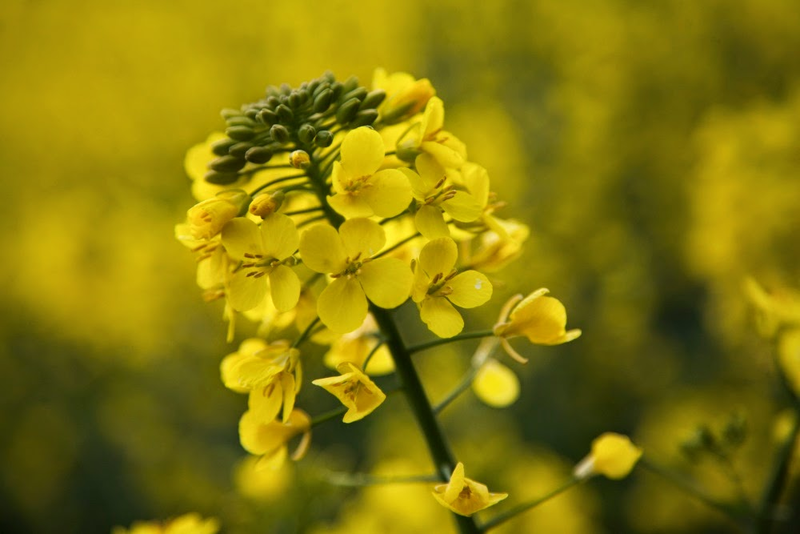 Strategie Grains released their latest forecasts on EU oilseed production, estimating the EU-28 rapeseed crop at 21.24 MMT, some 3.1% down on last year. They see average yields at 3.37 MT/ha. Ukraine said that they'd exported 39.4 MMT of grains in 2015/16, a record volume and one that is up 13% on last year. The total included 17.35 MMT of wheat, 17.40 MMT of corn and 4.41 MMT of barley and beat's last season's total by 4.61 MMT. Russia also shipped out a record volume of grain in 2015/16, although various official estimates vary slightly. The Ag Ministry total placed the figure at 33.8 MMT, slightly lower than Rusagrotrans' 34.5 MMT suggestion, but still a record nevertheless. The Ag Min's total was up 10.8% on last season and included 24.53 MMT of wheat, 4.23 MMT of barley and 4.70 MMT of corn. Rusagrotrans said that this year's harvest would be a post-Soviet era record 108-110 MMT, including 65.3 MMT of wheat (record), 13.8 MMT of corn (record) and 17.9 MMT of barley. The Czech Stats Office estimated the harvest there at 6.99 MMT, 9.5% down on a year ago. Wheat production will fall 6.8% to 4.915 MMT and barley output will be 16.7% lower at 1.659 MMT, they say. With 5 weeks of their marketing year to go Canada said that they'd exported 36.9 MMT of grains, similar to 2014/15. Wheat (excl durum) volumes are down 8% at 14.7 MMT, they say. 04/07/16 -- US markets are closed for Independence Day so the rest of us are left to paddle our own canoes. 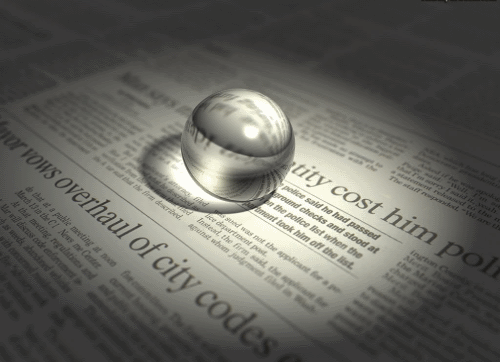 Trade will likely be thin and fresh news scant therefore. Strategie Grains are out early doors with their latest forecasts on EU oilseed production, estimating the EU-28 rapeseed crop at 21.24 MMT, some 3.1% down on last year. They see average yields at 3.37 MT/ha. Their figure is a little below 22.00 MMT from Coceral late last week. For sunflower Strategie Grains see production at 8.29 MMT, an 8.9% increase versus 2015/16 and soybean output is pegged at 2.38 MMT, a 3.5% rise on last year. Ukraine say that the preliminary numbers indicate that they exported almost 40 MMT of grains in 2015/16 (a record volume). That included 17.35 MMT of wheat, 17.40 MMT of corn and 4.41 MMT of barley. That's more even than Russia's record 34.47 MMT, and highlights exactly why EU prices have been in the doldrums for so long. No joy then that both are expecting increased production in 2016/17. On the no shortage of supply issue, the IGC Friday estimated the world cereal crop at a second largest ever 2026 MMT (outstripping consumption by 16 MMT even if the latter is at record levels). They increased the global 2016/17 wheat crop by 7 MMT from their previous forecast to 729 MMT (736 MMT last year) and were unchanged on corn at 1003 MMT (969 MMT last year). 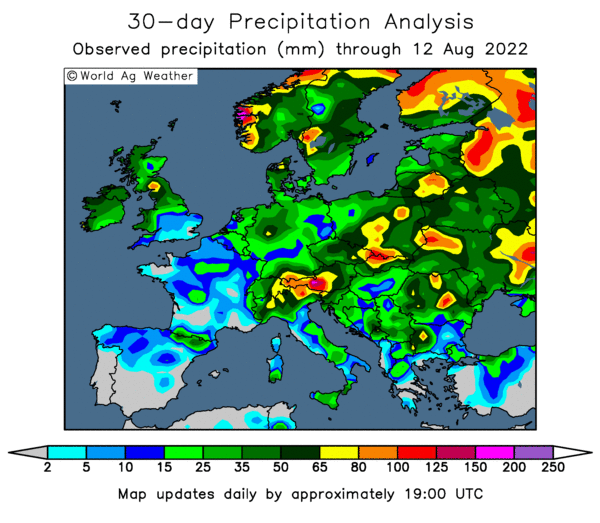 Heavy rains have improved prospects in Europe, North America and the CIS, they said. The record carryover from 2015/16 means that the new season begins with the largest total supply ever, they added.